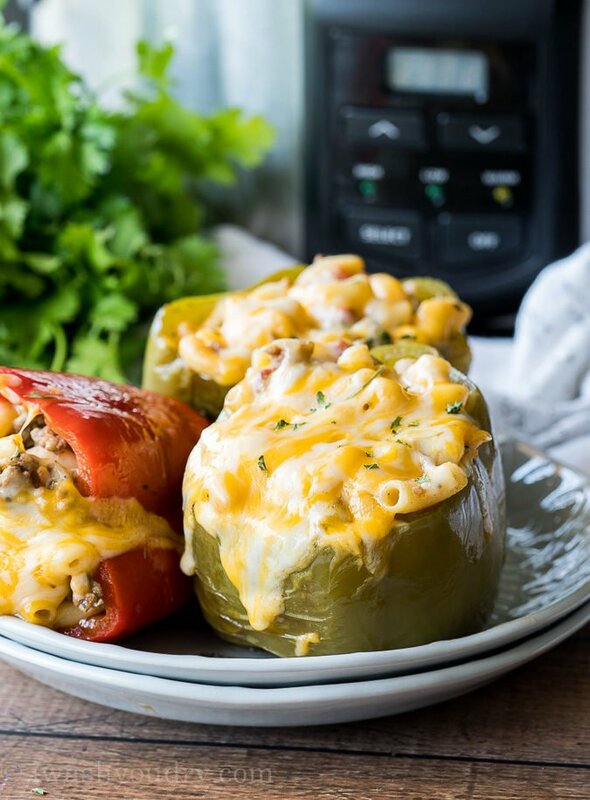 These super easy Slow Cooker Beef Macaroni Stuffed Peppers are filled with tender ground beef and cheesy macaroni, then slow cooked for a delicious dinner! 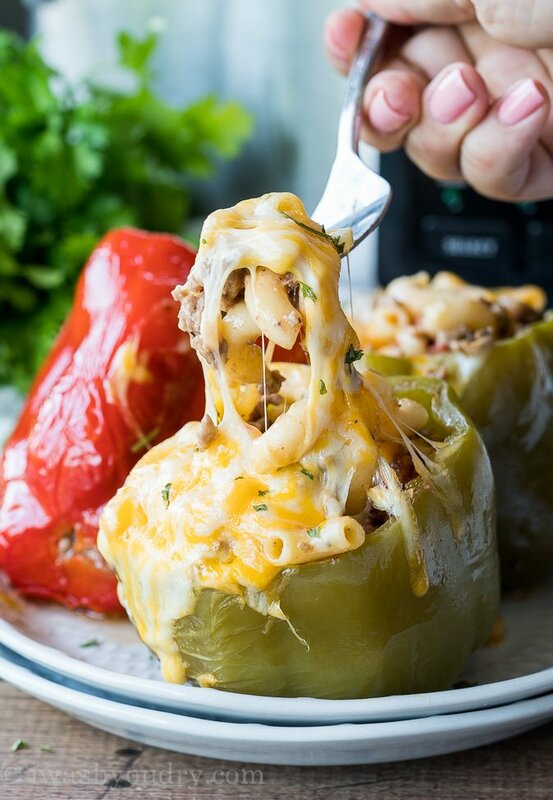 I’m pretty much obsessed with my slow cooker and instant pot these days, especially when I’m whipping up easy dinners like these stuffed bell peppers! I’ve partnered once again with Bob Evans Grocery to help solve that dinner dilemma. 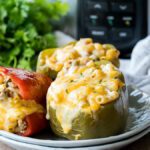 All you have to do is combine ground beef and ground sausage with their delicious and creamy Macaroni and Cheese, then stuff it inside some bell peppers and let them slow cook until dinner time! Right before serving, top the stuffed peppers with some shredded cheese and cover for another few minutes until it’s nice and melted. My kids LOVED these peppers. Even my 6 year old went back for seconds! This recipe calls for a combination of ground beef and ground sausage, which is quickly browned before being added to the bell peppers. Toss in a package of Bob Evans Macaroni and Cheese (no need to preheat) along with some diced tomatoes, a little oregano and basil and give it a stir. Stuff each pepper with about a cup of the filling and stand the peppers up in the crock pot! This filling is super delicious on it’s own, but when it’s stuffed in the pepper, well, it’s just magical. The pepper is sweet and juicy, while the hearty filling and cheesy topping bring it all together for a complete meal. I get this question a lot, believe it or not! 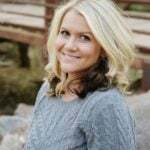 The short answer is yes, but here are some tips to help you! 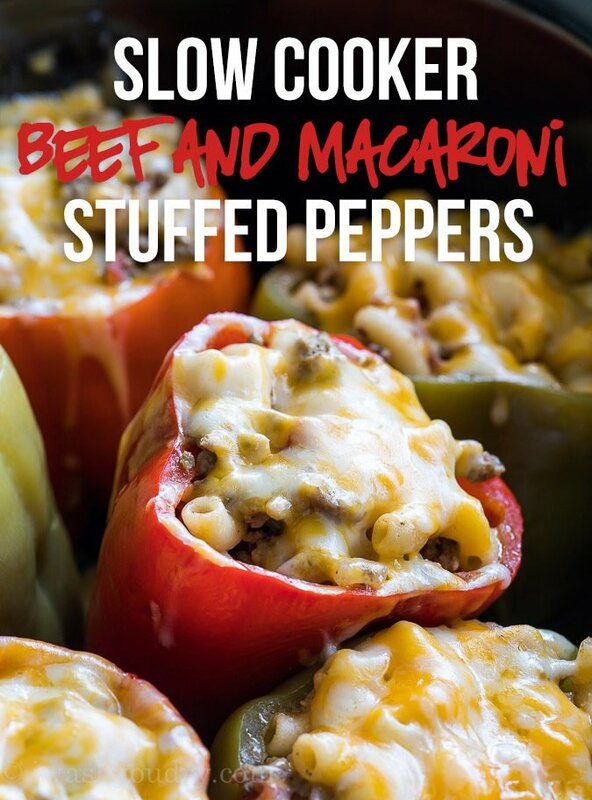 Only freeze after the stuffed peppers are cooked completely, then cooled to room temperature. Place the peppers in a freezer-safe dish and cover with aluminum foil, then wrap the entire dish in plastic wrap to avoid any air getting in. If you’re only freezing a few peppers, or want to freeze them individually you can do this by wrapping each one individually in plastic wrap, then place in a freezer bag to avoid freezer-burn. When you’re ready to eat: unwrap, pop into a 350 degree oven and bake until heated through. It doesn’t hurt to add a little fresh cheese on top either! 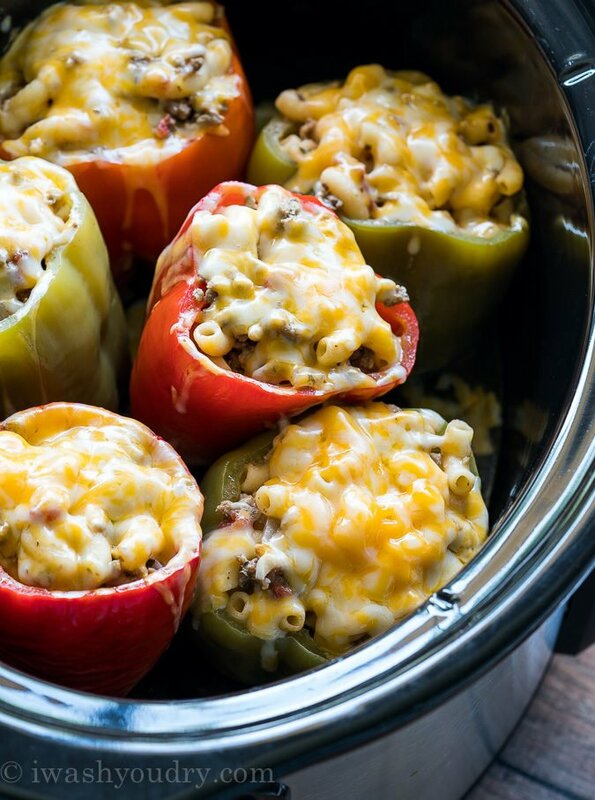 Frozen stuffed peppers can last up to 3 to 4 months in the freezer. 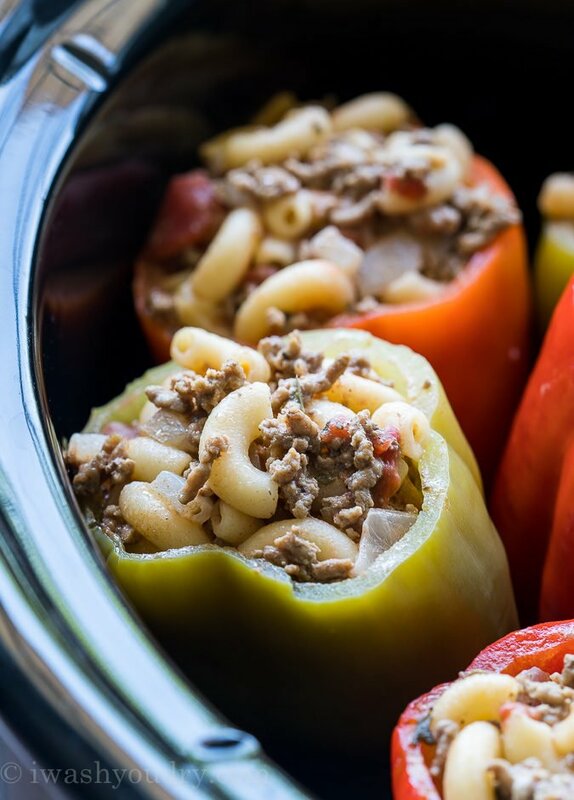 These Slow Cooker Beef Macaroni Stuffed Peppers are so easy to whip up, you’ll be adding them to your menu rotation for sure! Brown the ground beef, sausage, onion and garlic in a skillet over medium heat until no longer pink. Drain any excess fat. 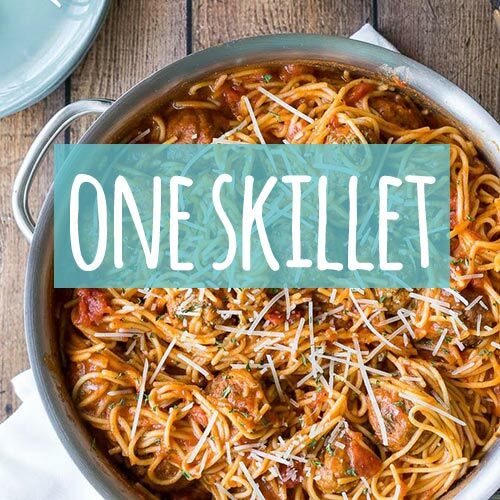 Add the Bob Evans Macaroni and Cheese, diced tomatoes, oregano, basil, salt and pepper to the skillet and stir to combine. Cut the tops off of the peppers and remove the seeds from the insides. Fill each pepper with approximately 1 cup of the meat mixture and place in the slow cooker, standing up. 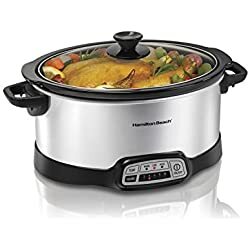 Pour ¼ cup of water on the bottom of the slow cooker and cook on HIGH for 3 hours or LOW for 5 hours. Once they’re cooked top with the shredded cheese and cover until the cheese is melted. Use a slotted spoon to remove the peppers from the slow cooker. Enjoy! Disclaimer: This post is in partnership with Bob Evans Grocery. All thoughts and opinions are 100% my own. Thank you for supporting the brands that help make I Wash You Dry possible. On the freezing the peppers. Are you talking about after you stuff them or can you just freeze the peppers after top is cut off and seeded? 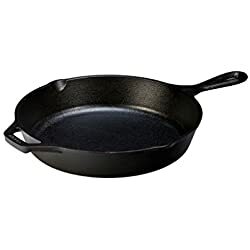 If so, how do you just cook the pepper by itself to get it done? 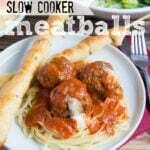 Will it be in a slow cooker or boiling water? 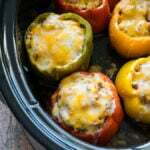 You can stuff the bell peppers and then freeze them prior to cooking in the slow cooker. To cook them, just pop them in the slow cooker frozen and cook! You’ll probably need to add a little bit of time since they are frozen. Thanks Shawn but what about just the peppers by their self, no stuffing? Can you bake these in the oven? Yup! Just fill and bake at 350 degrees, covered for about an hour. Top with cheese and place back in oven to melt. 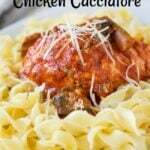 SO EXCITED TO COME ACROSS THIS RECIPE.i HAVE BEEN LOOKING FOR SOME MAKE AHEAD/FREEZE AHEAD DINNERS AND THIS IS JUST THE THING I NEED! 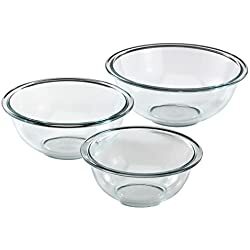 These are in my slow cookers right now…..I made 10 so needed to use 2 of my 3 cookers. They smell delicious and everyone is excited for dinner!!! Fantastic! I hope you enjoyed it! 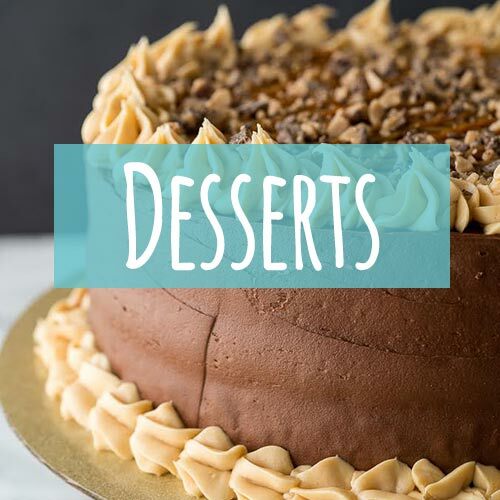 These look delicious, and I love that you gave directions for freezing them. It’s just my husband and I, so these will feed us for a few days! Thank you!